It's been some week! I worked at my old job for three days. It went well and it was great to see everyone! I was exhausted at the end of each of the days but I think that's to be expected. The weather, here in NY, has been crazy! Wednesday all hell broke loose here on Long Island. Torrential rains, floods, even a tornado! On top of that a steam pipe broke in NYC and was the other talked about topic on the news. One lady died of an MI while trying to get away. Most people, in the area, thought it was a terrorist attack. I can't even begin to imagine what it was like for those that were walking by at the time it let loose! I went to 112 Sewing (see link on the left) and I have my teaching schedule. 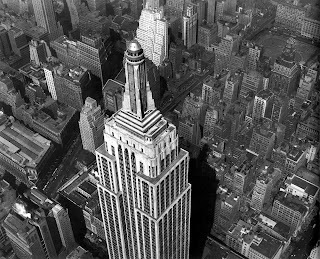 If people are as interested this year as they were last I should get in quite a few classes in the next six weeks here in NY. The above picture is an example of one of the classes I'll be teaching there. 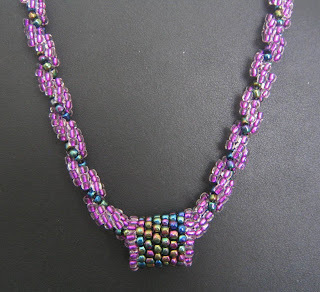 It's a necklace made with size 5 seed beads in the single spiral pattern. Today's my grandson's third birthday. I'm sorry I can't be in SC with him. I did give him a little party before I left him last week. He's so cute and smart! I miss him and his mom. Well, I'm back in New York! I made my journey in six days. I stayed with Liz on Tuesday, Wednesday and Thursday and traveled Monday, Friday and Saturday. I arrived here at 5 in the afternoon after, as usual, encountering much traffic in NJ on the turnpike and on the Belt Parkway! There was no traffic or crazy drivers anywhere else. It's always in NY area! Not the best ending to a 1200 mile journey. Going in the opposite direction is always much easier. You get all that traffic out of the way in the beginning! I had a flat tire twice! Thankfully it wasn't until I got to Liz's house and was parked in front of her house. I had a road angel (thankfully there's always one around when I need one!) help put the doughnut on the car and I took the car to a local tire place to have the tire fixed. It was flat again the next day! This time AAA was called and I went to Irmo Tire and bought two new ones. Since my other two tires were only three months old I just bought two. The rest of the trip was uneventful. I started reading (listening to) the Audible book, The Haunting, as I started out. I planned to stop at a motel in Fredricksburg, VA for the night. As I started listening to the book I was very surprised to find out that the book was about a hunting of a house on Caroline St in Fredricksburg! It was quite a romantic book and it made me anxious to see that city! After checking in the motel at 5PM I freshened up and went exploring the town. What a pretty town! The shops were mostly closed and the tours were finished for the day but I enjoyed just walking around after sitting in the car for 7 hours. I had dinner at a local Irish Pub on Caroline Street and it was delicious! I plan to stop there for a longer time and explore further on my way back to Florida. I'm home for a couple of days before taking off again for my trip to NY. My hurricane shutters are in place and my packing is half done. The jewelry making stuff is the most difficult to get packed up but I'm almost done. I'm happy I have someone to stay in my house for the time I'm away. This means I don't have to have everything totally locked down. Today's picture is from a collection given to me by my son. He and his family just got back from a holiday in Arizona. 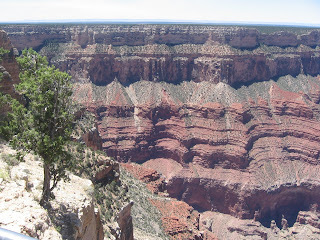 One of the places that they went was the Grand Canyon. I went there a few years back and I can tell you that pictures just don't do it justice! It is something that everyone should see sometime in their lives! Just one of the wonders of the country and the world that we live in! Well I'm back. The story about the macrame class and the necklaces I made in that class is a long one but I'll try to condense. I was late, very late for this class! I thought it started at 1PM and it really started at 11AM. I got a call at 11:50 wondering where I was. I hurriedly got ready and drove there. The other two students were almost finished with their first necklace (we were to make two). The teacher was a beautiful women from Columbia South America who speaks very little English. In spite of that she was able to communicate the directions to me and I was able to do well. She stayed later and let me finish both of the necklaces. It seems she was a psychologist in Columbia but is not able to practice here. It's a shame but I'm sure she will do well once she is fluent in English. I was pretty impressed with her! The Scottie necklace in the previous post contains the Scottie bead that I picked up in Beads and Baubles in Fort Pierce, FL when Luigi Cattelan visited last winter. He is pretty famous and comes from a long lineage of glass blowers in Murano, Italy. He will have an article in the coming October issure of Beads and Buttons. 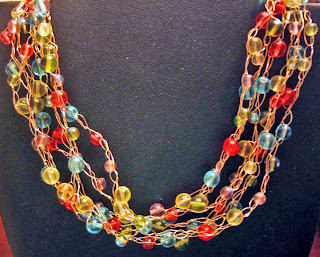 Along with Luigi, Susan Barrette, owner of Beads and Baubles with have her work with Luigi's beads, focused in that issue. I can't wait for that issue to appear on the news stands! It should be a treat for the eyes! 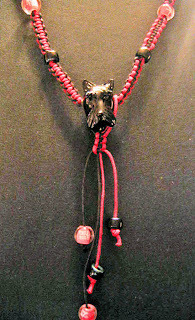 The Scottie necklace is in memory of our doggie, Bonnie Jean MacKenzie, who left us last July. We all miss her still! The necklace in this post is bead crochet. I made it in one evening and it now adorns my daughter's pretty neck! Yesterday was my granddaughter's ninth birthday and the party was at Chunk E Cheese! That place did a great job running the party. Our hostess was wonderfully helpful. To me, though, I think that that job is a nightmare job! The noise level alone would make me a wreak! But never the less a good time was had by all! The picture is one of the macrame necklaces that I made at the class on Friday. More to come on that class later. I've gotta run and do some errands now!